This poster has a few minor imperfections. Not in perfect shape but still very presentable. No tears, no tape, no pin holes! Please examine our extra large images very carefully!! These detailed photos generally speak for themselves. We do not always list every little defect!! We try and list any that we think are important or those that may not be readily visible. We realize that nobody likes surprises. Still a very nicely preserved item. C6 Very Good - The typical used poster in average condition. C5 Good to Very Good - A heavily-worn item. C4 Good - Below average but still suitable for display. C3 Fair - Heavily worn, but yet still complete. C2 Poor to Fair - An extremely worn, possibly even incomplete item. C1 Poor - The lowest grade, representing items in the lowest possible condition. Some of our posters are "between grades". For example, a C8-C9 poster will contain all the qualities/characteristics of a Near Mint C9 except for one or two very minor flaws that we believe prevent it from being a true C9. Sometimes it isn't possible to do this. Rolled posters are put into a plastic sleeve and then placed in a HEAVY-DUTY TOUGH 3 or 4 diameter thick walled PVC tube. We roll the poster into a smaller diameter than the tube. This is VERY IMPORTANT because it gives the edges strength and helps to prevent them from getting wrinkled. We add soft cushioning material also very important! On the ends to prevent them from getting damaged. We stamp FRAGILE: DO NOT BEND on the outside of the package. To protect ourselves, we insure expensive items for the FULL AMOUNT. These combined charges can add up to 25% or more to your final cost. Unless otherwise specified in the description, ALL POSTERS ARE ORIGINAL MOVIE POSTERS original theatrical movie posters that were displayed or meant for display (unused) in theaters at the time the movies were released. We will put in writing that we guarantee it to be an Original Movie Poster. 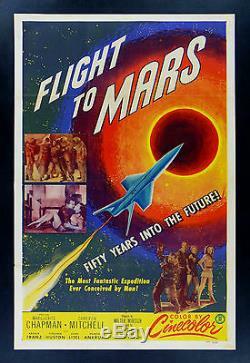 The item "FLIGHT TO MARS CineMasterpieces ORIGINAL SPACE ROCKET SCI FI MOVIE POSTER 1951" is in sale since Thursday, August 11, 2011. This item is in the category "Entertainment Memorabilia\Movie Memorabilia\Posters\Originals-United States\1950-59".